High Quality Content by WIKIPEDIA articles! Q'umarkaj is an archeological site in the southwest of the El Quiché department of Guatemala. Q'umarkaj is also known as Utatlán, the Nahuatl translation of the city's name. The name comes from K'iche' Q'umarkah "Place of old reeds". Q'umarkaj was one of the most powerful Maya cities when the Spanish arrived in the region in the early 16th century. It was the capital of the K'iche' Maya in the Late Postclassic Period. 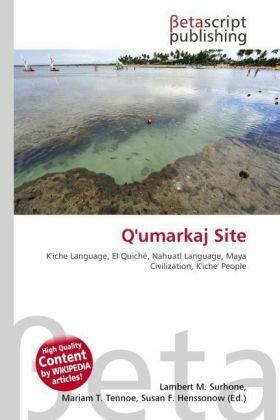 At the time of the Spanish Conquest, Q'umarkaj was a relatively new capital, with the capital of the K'iche' kingdom having originally been situated at Jakawitz (identified with the archaeological site Chitinamit) and then at Pismachi'. Q'umarkaj was founded during the reign of king Q'uq'umatz ("Feathered Serpent" in K'iche') in the early 15th century, immediately to the north of Pismachi'. In 1470 the city was seriously weakened by a rebellion among the nobility that resulted in the loss of key allies of the K'iche'.